As the end of an age approaches, blood soaks the earth, twisted prophecies wield immeasurable power and tyrants demand impossible sacrifices. Return to the rich and fantastical world of Eleanor Herman's Blood of Gods and Royals! Prince Alexander's mind has been touched by an incomprehensible evil, even as his betrothed travels from afar to unite their kingdoms against a terrible darkness that threatens both realms: the Spirit Eaters. From the distant shores of Illyria to a small deserted island, the deadly consequences of Smoke Blood magic loom and lost civilizations emerge to reveal the existence of a weapon that may do the impossible--kill the last living god. As magic rises and warriors clash, the fate of all Macedon rests in the hands of the unstable prince and those whose loyalty can no longer be trusted. 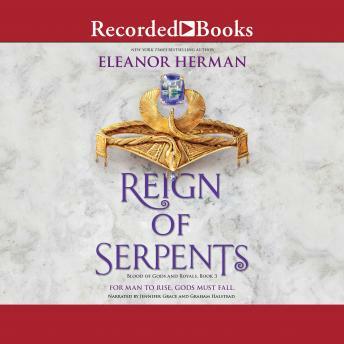 New York Times bestselling author Eleanor Herman deftly reimagines the reign of the world's most brilliant ruler, Alexander the Great, in book three of the Blood of Gods and Royals quartet.